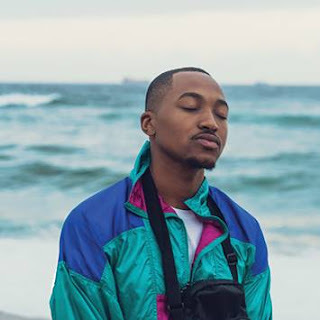 The multi award winning South Africa's top Hip Hop artist AKA will be treating five fans to lunch and drinks on him on 10 December 2012 at the Cappello Fourways Buzz Centre. AKA has professed that he is nothing without his fans and wants to treat them to something special. He decided to run a competition because he would not know which five fans to choose. “My fans have been amazing. Without them I am nothing.” exclaims AKA. 3) Get your friends to vote for you by "liking" your wall post. 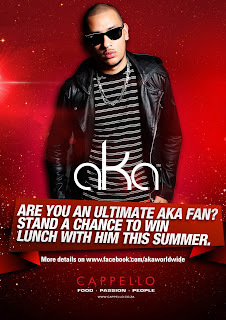 1) The two highest voted posts will join AKA for lunch alongside the three most creative wall posts chosen by AKA. 2) Lunch will be at Cappello in Fourways (The Buzz Shopping Centre, Corner Witkoppen and Nerine Road, Fourways, Johannesburg) at 14h00 on 10 December 2012. 3) Winners will be chosen on Friday 7 December 2012 at 18h00. 4) AKA’s decision will be final. 5) Winners need to make their own way to Cappello on 10 December 2012. No flights, transport or accommodation will be provided. 6) Lunch and drinks will be covered by AKA. 7) Winners' pictures will be posted on Facebook and other media platforms. So, here's a question, are you an ultimate AKA fan? Stand a chance to win lunch with him this summer. All details above!! !